This New edition of the “Settlers of Catan – Board Game” features a six piece reversible board allowing for more replay value than the previous Gallery Edition. Get together with friends or family. Learn to play in about 15 minutes. Then enjoy countless hours of fast-paced fun! 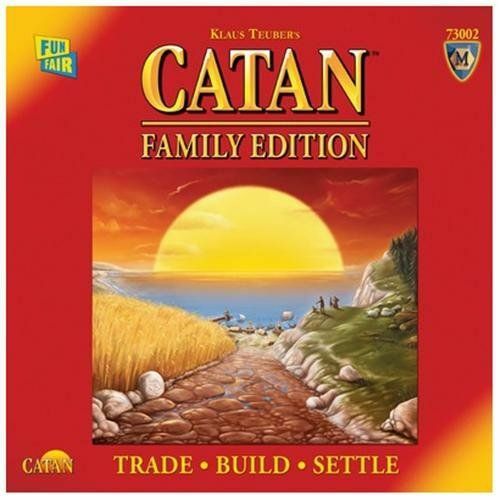 Begin a quest to settle the island of Catan! Guide your brave settlers to victory by using clever trading and shrewd development. Use resources – grain, wool, ore, lumber, and brick – to build roads, settlements, cities and key cultural milestones. Get resources by rolling the dice or by trading with other players. But beware! You never know when someone will block your way or if the robber will strike and steal your hard-earned goods! Are you the best trader, builder, or settler? Will you master Catan?